Have you ever walked in to a home and had your jaw drop to the floor because of the overall presence of the home? Everything is perfectly placed and you fall in love with the home, in part, because of the possibilities to take it and make it your own. Chances are, if you’ve had this type of experience the home was professionally staged! 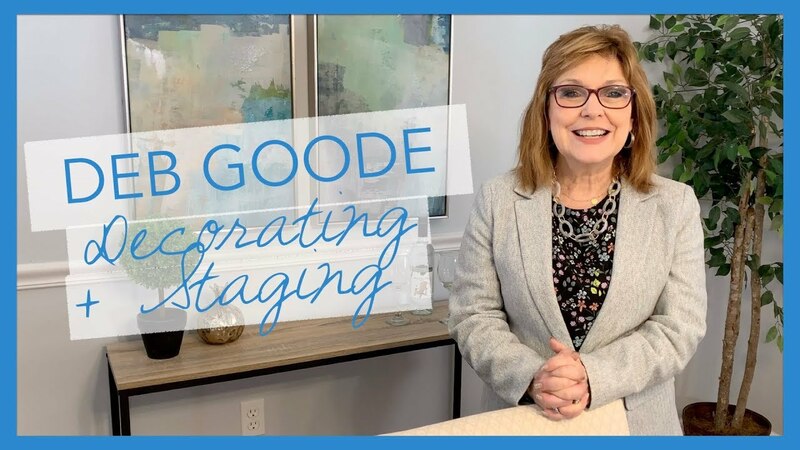 Deb Goode of A Goode Start Decorating and Home Staging helps sellers prep their home for sale by showing potential buyers the realm of possibility when it comes to styling the home. Whether you’re thinking about selling your home, or just need some style inspiration, you’ll want to check out this video! Buyers get an emotional response when they walk into a staged home that they wouldn’t normally get in other ways. Even seeing it on their phones or on their laptops is different than when they actually walk into the house, and see it staged. They love it! They think, “oh my gosh; we walked into a model home, and this is the way my house could look if I move in here.” And the way that the stager usually does the staging is that there is a flow from room to room with colors and themes, so that there’s a continuity. So I’ve been a stager for about 10 years now, but I had a life before this. When I was a kid, I always loved to decorate, and I would go with my parents to model homes, and I’d dream about decorating the new house. Finally, after a long career in the federal government, I decided that I would pursue my decorating career. I took lots of courses, and became a Certified Interior Decorator. Then, in 2008, I fell in love with staging! Because back then, the houses really needed a little oomph to sell. So I took staging courses, and fell in love with home staging. And that’s where I am today! I do my best to transform houses into something that’s going to sell quickly, for the most money possible, and let the owners transition to their new chapter in their life. Do you have any tips for how to stage a room? The sofa really needs to look perfect, because a lot of times, that’s the focal point of the room. However, it could also be something else; an architectural feature like a fireplace. In this house, it’s gonna be the fireplace that’s gonna be the first thing that people see when they walk in the door. So I’m going to put some accessories on the fireplace. I found the perfect pictures! Put them up… And then the next thing is to dress the mantle. Couple more things… Oh, that needs a third accessory. Okay, now that pulls the gold from the picture. And voila! We’ve got a dressed mantle. In the end, if I can make it easier for the homeowner to sell their house, quicker, faster, for more money, and also making a new buyer happy to get such a great house, it’s a great day! It’s why I just love being a home stager!